I actually collected this leaf (Figure 1) yesterday while I was carrying the Coffee Tree leaf back. The Horse-chestnut one of my favorite trees in the spring when it flowers. People say the flowers look like candles and, on a dark, rainy day, the tree does seem to light up when the flowers are in bloom. Figure 1. 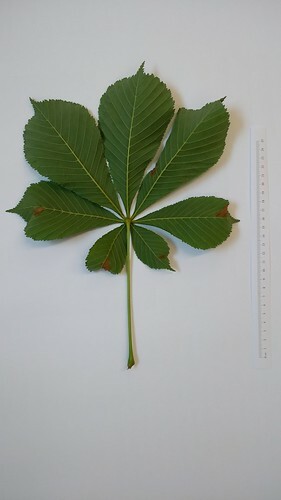 Aesculus leaf. Upper side is on left. 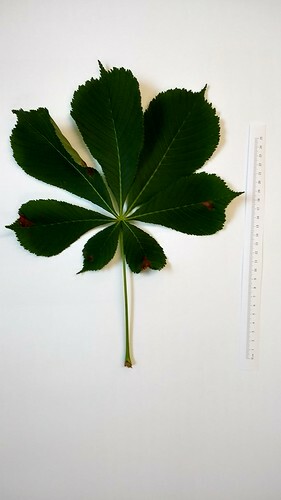 The leaf is palmately compound with 7 leaflets. The leaves are ovate with irregularly toothed margins. The venation is not opposite, but nearly so. The stem seems extremely long, relative to the leaf. The leaf has several patches of what appears to be a fungus. In each area is a brownish red region surrounded by a brownish region. The regions cross side veins, but rarely cross the mid-vein. There is some brownish material on the underside of the leaf where leaflets come together.